Electrical Safety Month may be over, but that doesn’t mean that these 11 safety tips are old news. 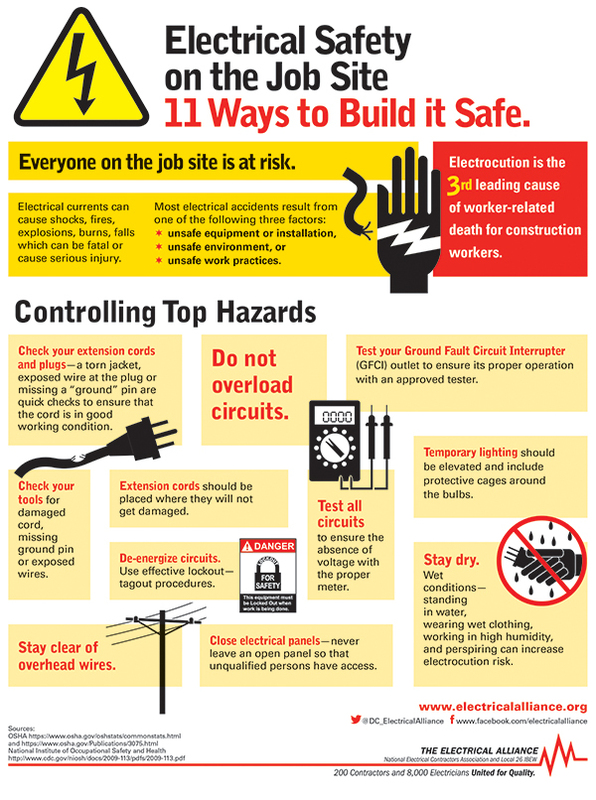 The month of May was Electrical Safety Month, but each day everyone on the job site is at risk of serious injury or even death. Electrocution is the third leading cause of worker-related death for the construction industry and according to the Electrical Safety Foundation International, there have been over 30,000 workers injured in electrical accidents within the last 10 years. Avoiding electrical accidents requires careful attention to those simple, but often overlooked safety precautions. The key is remembering to use and maintain electrical products properly. Washington, DC Chapter of NECA Safety Director, Vince Miller conducts regular safety classes using NFPA 70E, National Electrical Safety Code (NESC) and the OSHA standards (Construction, General Industry and Maritime) for local Electrical Alliance contractors and their employees.